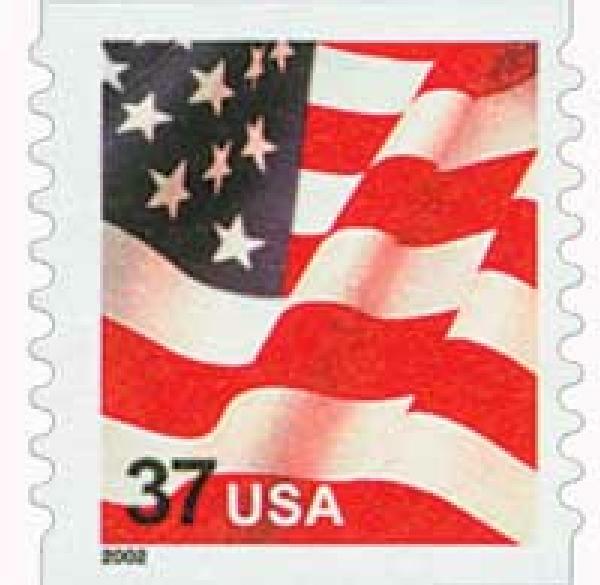 U.S. #3632 was printed by the BEP for the last time on June 10, 2005. 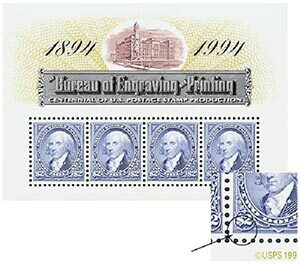 On June 10, 2005, the Bureau of Engraving and Printing (BEP) printed its last U.S. stamp. The BEP was established in 1862, following the outbreak of the Civil War. When the firing on Fort Sumter began, the nation was already on the verge of bankruptcy and was in no position to finance a war. This matter, along with other war issues, prompted President Lincoln to call a special session of Congress. During this session, Secretary of the Treasury Salmon P. Chase suggested issuing noninterest-bearing notes that would circulate as money and a system of domestic taxation. Congress adopted the Chase plan, and as a result the first government-issued paper money came into existence. That same year, the President appointed a commissioner of internal revenue, who was given the authority to assess, levy, and collect taxes. Items such as medicine, perfume, cosmetics, alcohol, and tobacco were taxed, and stamps were provided as proof of collection of the tax. The BEP began by printing only the beer and cigar stamps, but by 1878, nearly all revenue stamps were produced by them. 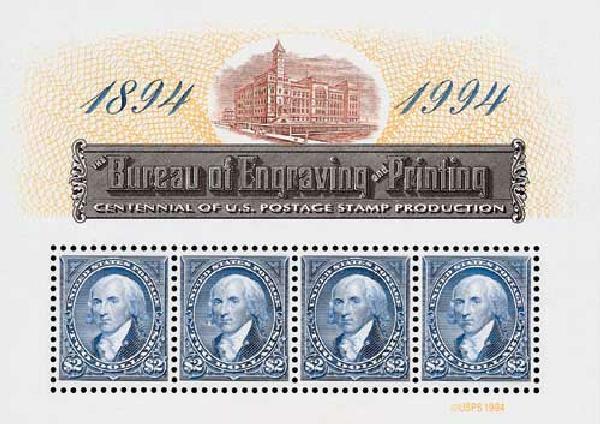 U.S. #2875 was issued for the 100th anniversary of the first BEP stamps. In 1894, with the approval of the Secretary of the Treasury, the Bureau submitted a bid for the contract to print the new series of postage stamps. Their bid was almost $7,000 less than the lowest bid submitted by the three private companies also competing for the contract. Despite loud protests that the Bureau was not capable of producing the stamps, they were awarded the contract. U.S. #256 – The first U.S. postage stamp produced by the BEP. The BEP used the same dies previously used by the American Bank Note Company for their first series of stamps, but made small changes to them so the stamps could be distinguished from the previous issues. 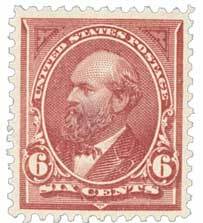 The BEP printed its first postage stamps on July 1, 1894. The very first stamp produced by the BEP was #256, the 6¢ Garfield, issued less than three weeks later on July 18. Soon, the BEP began producing most U.S. postage stamps. In the coming years there were several major milestones. The BEP produced its first coil stamps in 1908, first used the rotary press in 1914, and began experimenting with electronic controls in the perforating process. During World War II, the BEP produced Allied military stamps that were used in Italy, France, Germany, and Austria. The BEP printed its first full-color stamp on the Giori Press, #1094, in 1957. U.S. #M7053 – U.S. #2875 with a major double transfer. For about 75 years, the BEP produced nearly all U.S. postage stamps (except for the 1943 Overrun Countries printed by the American Bank Note Company). This began to change in the late 1960s when the U.S. Post Office began issuing contracts to private security printers. BEP stamp production dropped significantly, to less than 50% of all stamps in 1997. The last BEP-produced stamp was #3632, printed for the last time on June 10, 2005. Click here to see what else happened on This Day in History. This entry was posted in June 2017, This Day in History. Bookmark the permalink. 6 Responses to "This Day in History… June 10, 2005"
Such a shame! The BEP used to print the most beautiful stamps. We don’t see anything new like them anymore, and we probably never will again. Who prints our stamps now? Private companies like American Bank Note, J. W. Fergusson & Sons, of Richmond to name two. The U.S. even prints U.S. stamps in foreign countries (like Canada) in an attempt to save money. Currently, I’m not sure but I think BEP still does make some stamps. Do enjoy this bit of history daily. I love these old stamps but with email and the electronic transfer, who know where stamps will be in supporting the future.